The Tuesday Tussle; the biggest illustrators squaring off against pop's biggest icons - icons you never thought they'd touch. 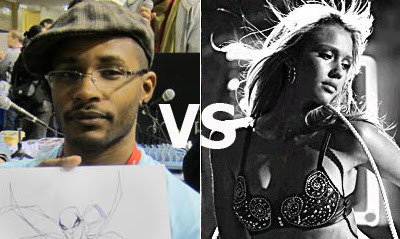 This week, if 2011 has an artistic find for me it's the art of Khary Randolph. His work on BOOM Studios' Starborn is simply drool worthy. Now I pit him against the equally drool-able good-girl-gone-bad, Nancy from Sin City, to see who comes out tops. Fight! WINNER: Khary. Oh man, why didn't I run into this guy sooner? 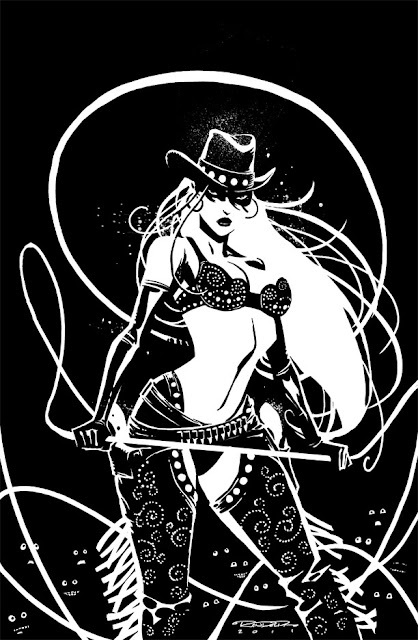 While it may be hard to make a blonde in a cowboy bikini with a whip look bad, Randolph injects just enough Frank Miller to stay faithful (and maybe a little Joey Q on the whip) while still using his own style to give it something different. Nancy #1, monthly from Dark Horse? Make it happen people! To see more of Khary's crazy-cool portfolio, click the jump. Wow, Dave. This Khary guy's art with this one looks exactly like what Frank Miller and Tim Sale's art baby would look like. Nice one. Tim Sale! Thanks Dale, I knew there was a second influence there, but couldn't quite place it.